The wildly popular and acclaimed Grand Theft Auto V, released last year, will be remastered for Xbox One and PlayStation 4 Nov. 18 of this year. A PC version will follow on Jan. 27, 2015. Publisher and developer Rockstar Games released the details, as well as a new trailer, titled “A Picket Fence and a Dog Named Skip,” found below. The remastered edition will feature aesthetic and technical enhancements. This includes higher resolution and increased draw distances. Increased draw distance means you can see further into the Los Santos coastline, instead of having it pop-up as you drive towards it. The also game features a breadth of new content. New activities, weapons, vehicles, animals, damage and weather effects, foliage, and more than 100 new songs. Additional new content is available for those who already own the original PS3/Xbox 360 versions of the game. 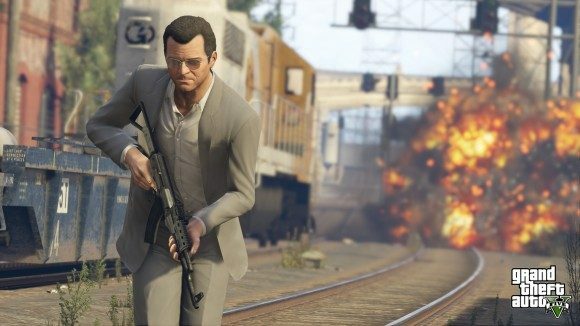 Content includes rare versions of vehicles from previous games in the Grand Theft Auto series, more activities, new shooting range challenges, new weapons, and, interestingly, wildlife photography. However, this content is only for those who completed the prologue on the original release on either PlayStation Network or Xbox Live, and still have an account under the respective service. They will also need a Rockstar Games Social Club account. Grand Theft Auto Online will be receiving some love too. There will be an increased player count for PS4 and Xbox One versions –30 players. All players who pre-order the new edition get $1 million to spend online, or in single player. Character and game progression from the 360 and PS3 versions will be transferrable to any of the 3 systems harboring the remastered editions.